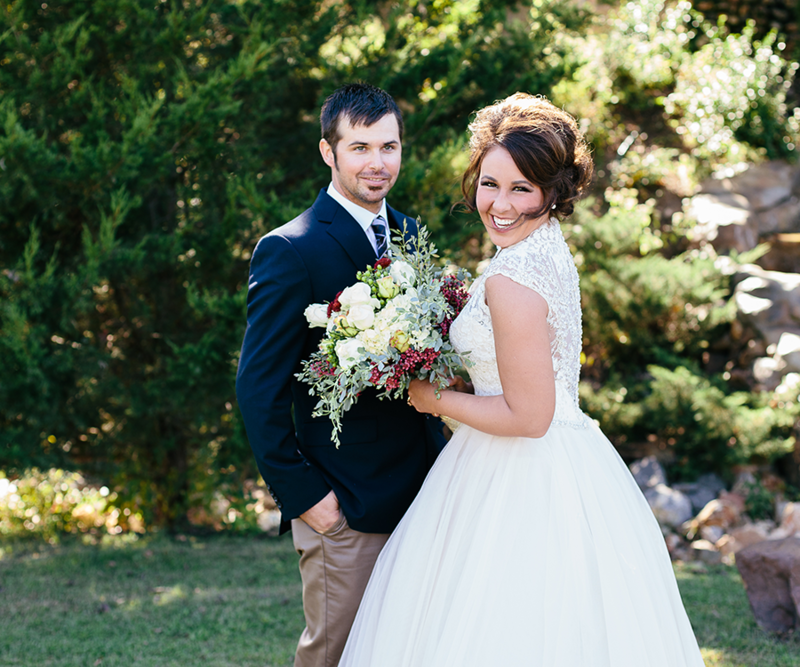 Michelle McLain and Chad Chapman fell in love all over the Ozarks. Then on a deer stand outside of Pierce City, Chad asked Michelle to marry him. 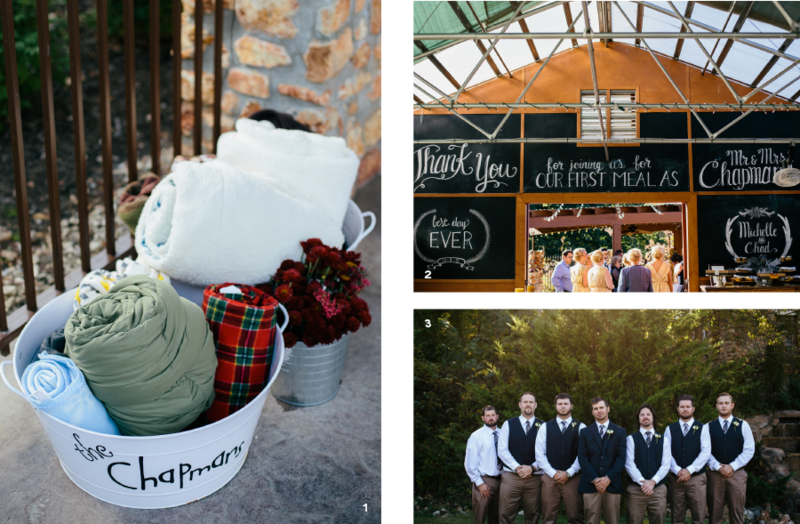 Big Day Bliss: Chad Chapman and Michelle McLain enjoyed gorgeous weather at their October wedding. It all began with a simple dance. Michelle McLain and Chad Chapman were both at a dive bar in Miller watching The Mark Chapman Band play. Chad spotted Michelle from across the room and came up to her, asking her to dance. Music filled the room, and the couple swayed to songs performed by Mark and Jeff Chapman, Chad’s cousins. The couple hit it off and met for their first date, this time in Springfield. Chad drove up from Pierce City, and Michelle introduced him to Chick-fil-A. For the next four years, they danced and ate and fell in love as they ventured around the Ozarks. And then on September 6, the couple went to Republic so Chad could buy a golf cart. 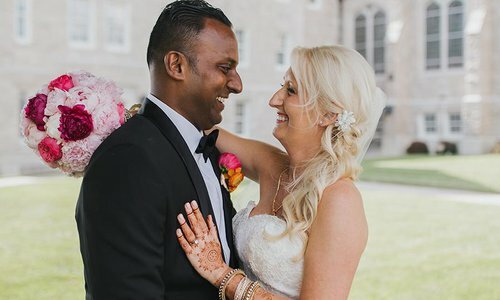 On October 3, 2015, Michelle and Chad were wed at Springhouse Gardens in Joplin by Dale Assink, who married the bride’s parents 32 years earlier. 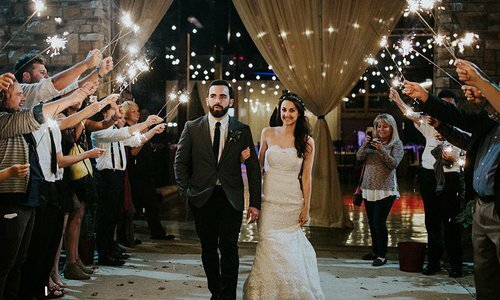 The glittering, rustic affair featured shimmering gold details throughout. The bride’s lace ballgown dress from Normans Bridal was accentuated by a stunning bouquet arranged by the bride’s mother, Jane McLain. Custom hand-drawn chalkboard signs by calligrapher Erin Havens hung over the couple’s pie bar that featured several types of pies made by family and friends. 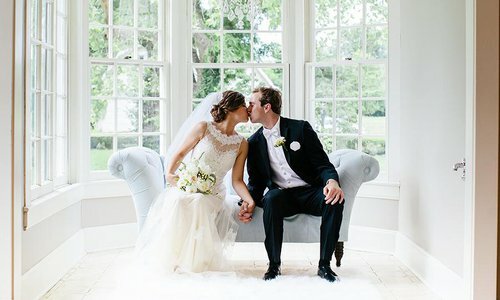 For their first dance, Michelle and Chad swayed to “Makin’ Plans” by Miranda Lambert. Chad’s cousin Jeff and his now-wife Katy, Michelle’s sister and maid of honor, joined them on the dance floor later that night. Love is in the Air: 1. 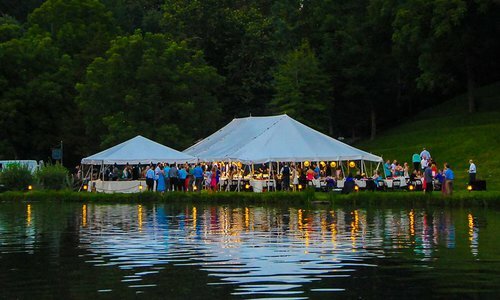 To keep guests warm on a cool October evening, the bride and groom provided blankets at the indoor-outdoor reception venue. 2. Hand-drawn chalkboard signs flanked the entrance to the reception space. A pie bar featuring desserts made by friends and family served as a sweet ending to the day. The bride’s favorite? Pumpkin pie. 3. The groom wore apparel from Dillard’s and was flanked by his best friends: best man Kalen Thomas and groomsmen Chase Chapman, Chance Chapman, Jason Gunter and Todd Forgey and ushers Jeff Hatfield and Dustin Davis. 4. 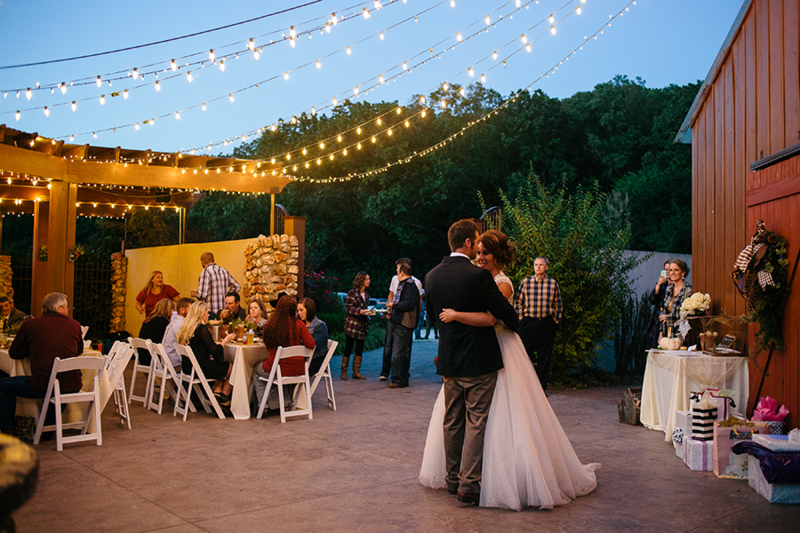 The indoor-outdoor reception glowed with romantic lights under clear skies. Special Touches: 1. 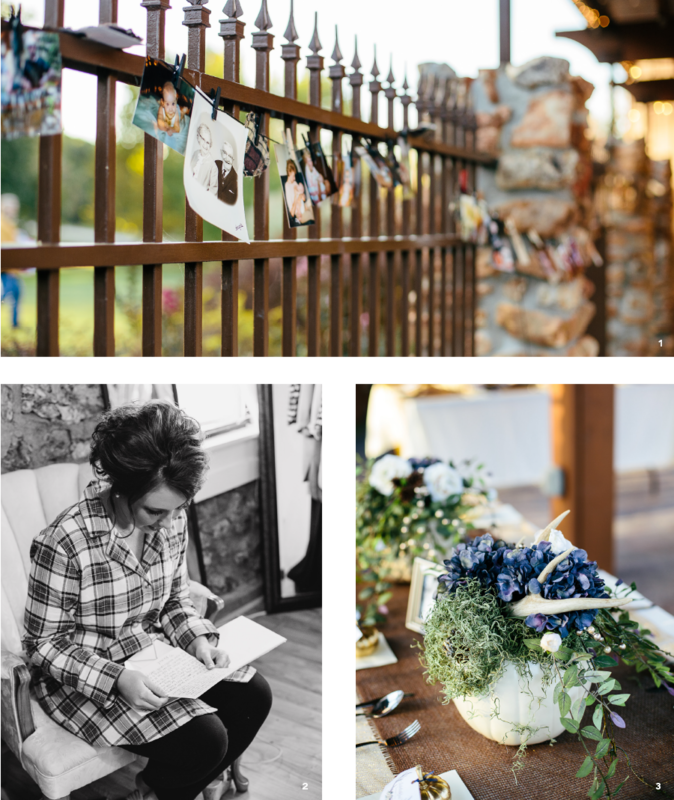 Pictures of childhood memories and loved ones hung from wrought iron fencing at the reception space. 2. A sweet moment before the ceremony, Michelle read notes of love and well wishes from bridesmaid Rachel Pyle. Her maid of honor, Katy Chapman, had her bridesmaids and best friends all write notes for Michelle on her wedding day. 3. Lilly’s Floral provided the flowers for the rustic and romantic day, but the bride’s mother, mother-in-law and aunts arranged the bouquets. The bride’s mother paid special attention to her daughter’s bouquet, which she arranged. 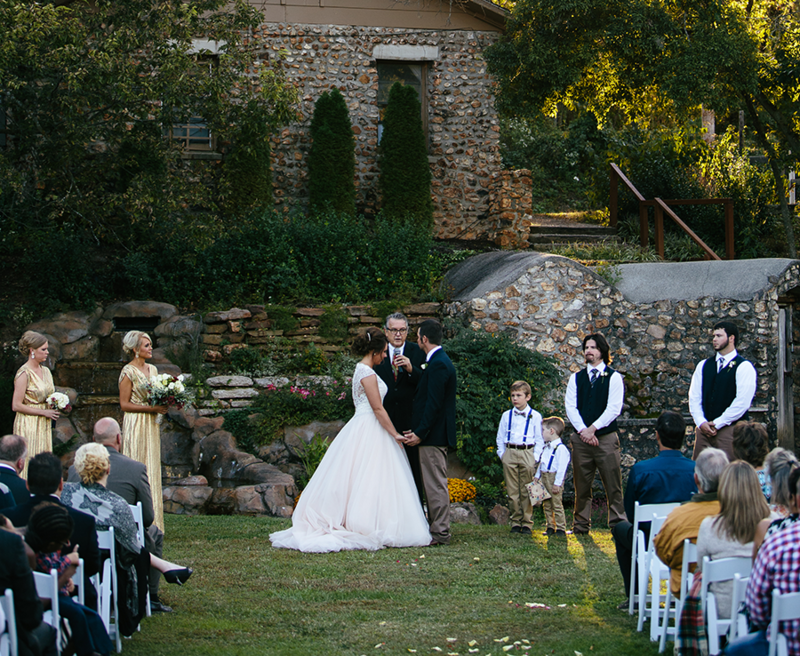 Sunny Skies: Joplin’s Springhouse Gardens provided the perfect backdrop for Michelle and Chad’s wedding day. All in the Details: 1. These boots were made for walking down the aisle. The girls wore boots while they got ready for Michelle’s big day but wore heels down the aisle. Attendants included maid of honor Katy Chapman, bridesmaids Lauren Carlisle, Rachel Pyle, Cari Rostine and Crystal Beach and hostesses Olivia Tyson, Bethany Forrester and Cassie Dawson. 2. 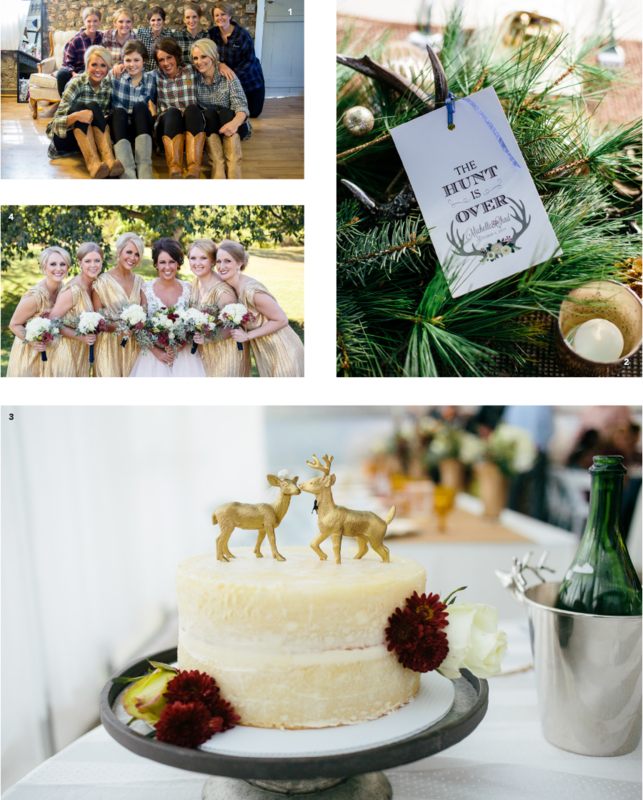 Several of the wedding’s decorative touches hinted at Chad’s love of hunting. 3. The couple cut a small cake made by Michelle’s aunt. 4. The bridesmaids sparkled their way down the aisle in shimmery gold gowns. 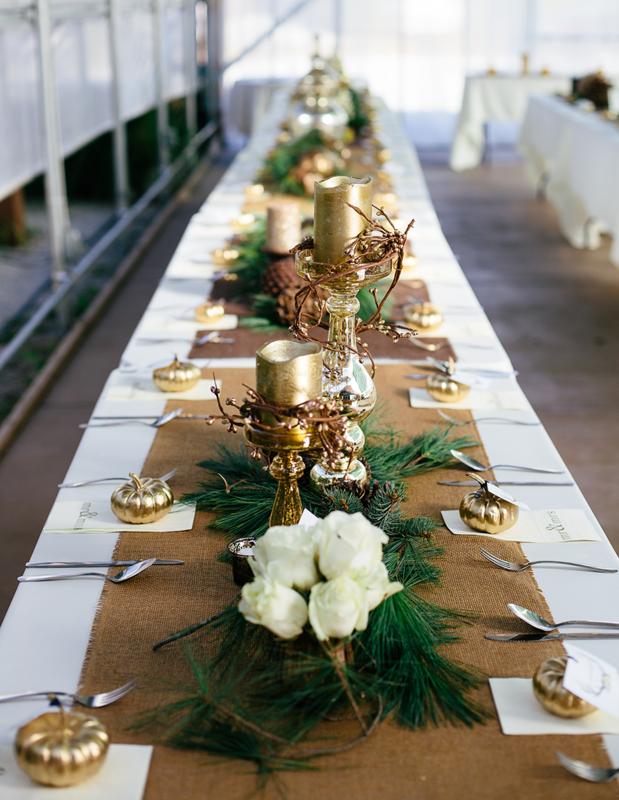 Top it Off: Long harvest tables featuring golden pumpkins for place cards and burlap runners with greenery created an elegant but rustic feel to the day.